I have to say that as soon as I arrived here it did feel slightly strange not to have the Ganges next to me. With the exception of Lucknow the river has been my constant companion on this voyage which started all those weeks ago up in the snowy heights of the Himalayas. My reasons for not visiting towns here in the state of Bihar that border the Ganges are two fold. I’ve been told that the towns along the river are very industrialised and do not offer much photographically and also Bihar (one of the poorest states in India) does unfortunately have a reputation for lawlessness and banditry. Although all my equipment is insured at this point in the trip I don’t have the time or the funds available for a return flight to Delhi to replace any kit that I may have been relieved of on the way to photograph an eyesore bordering the Ganges. 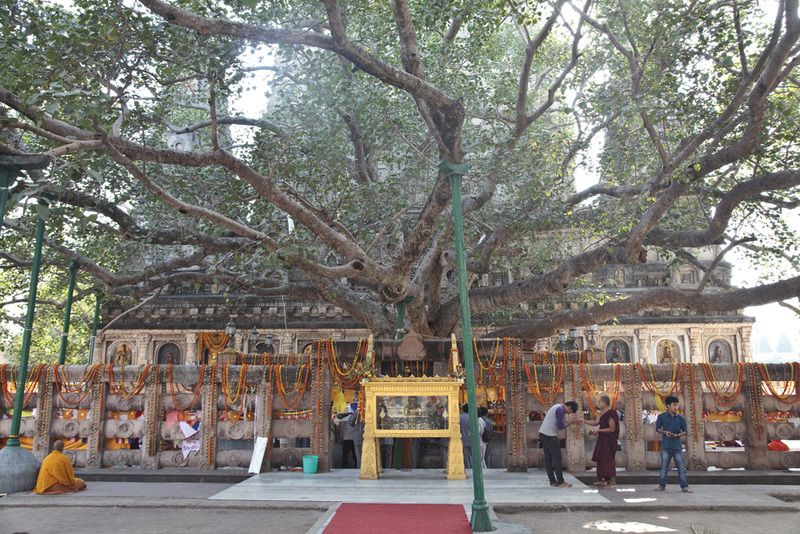 As for Bodhgaya the main temple here is the Mahabodhi which contains a descendent of the original Bodhi tree (it’s actually a fig tree) which was planted in 288 BC. 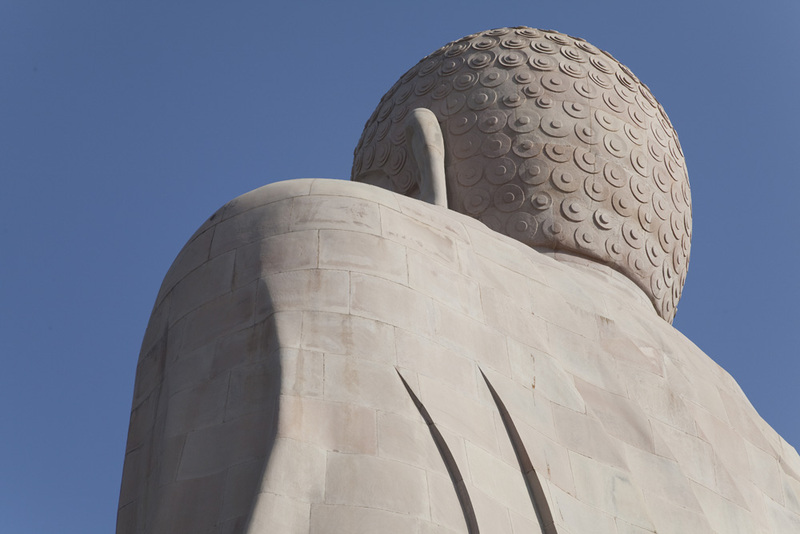 According to Buddhist texts it is said that Gautama Buddha spent one week gazing with unblinking eyes at the tree in gratitude after his enlightenment. 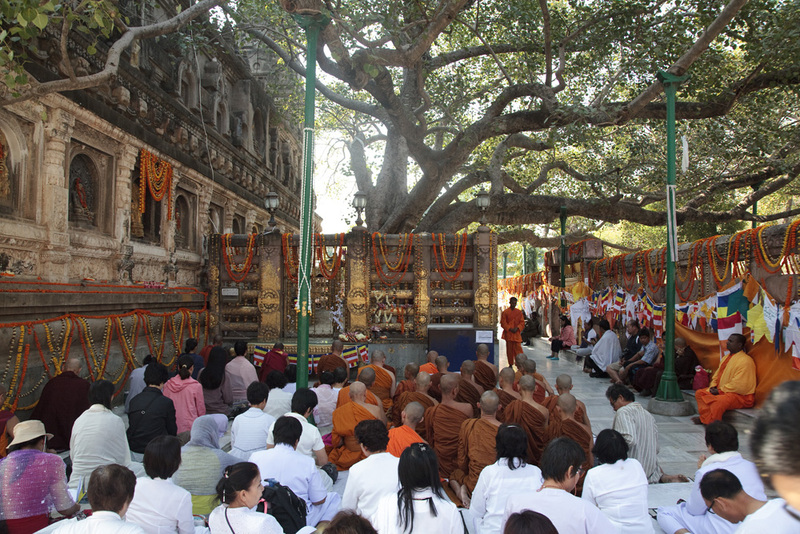 The tree is enormous with branches that spread themselves widely over the temple grounds. 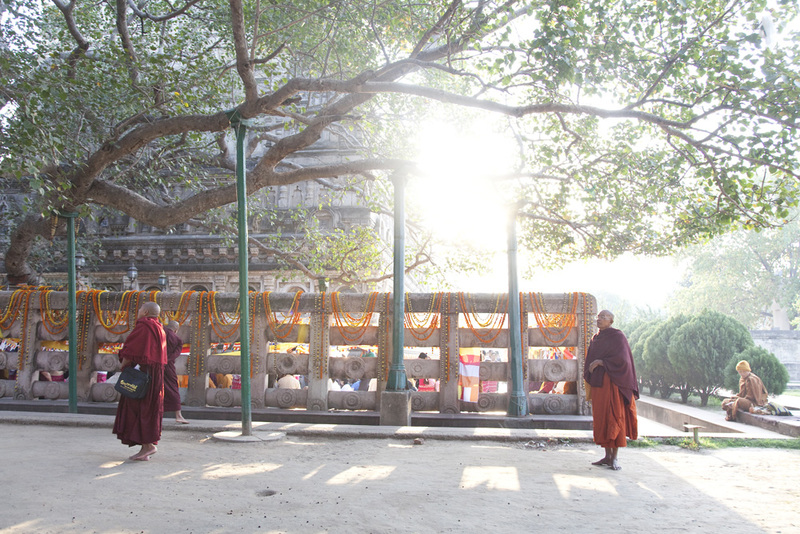 At any time of the day (most of these shots were taken early in the morning) you can find many people sitting under it’s branches chanting and meditating. 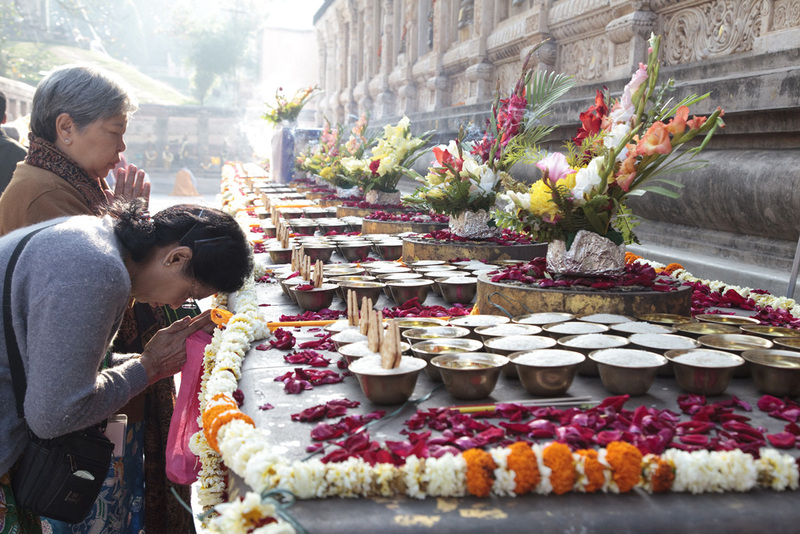 The atmosphere here is really something with the rhythmic sound of the prayers being mumered continually by the devotees. Unlike other pilgrimage places that I’ve visited so far on the trip this destination differs as it attracts people from outside India itself. 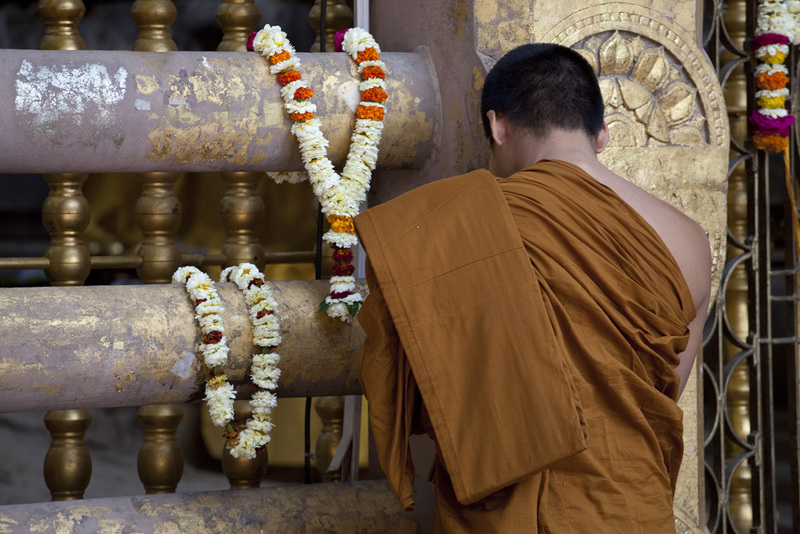 Buddhism is followed across much of the globe and I’ve seen visitors from Japan, Tibet, Thailand, Sri Lanka and Vietnam. 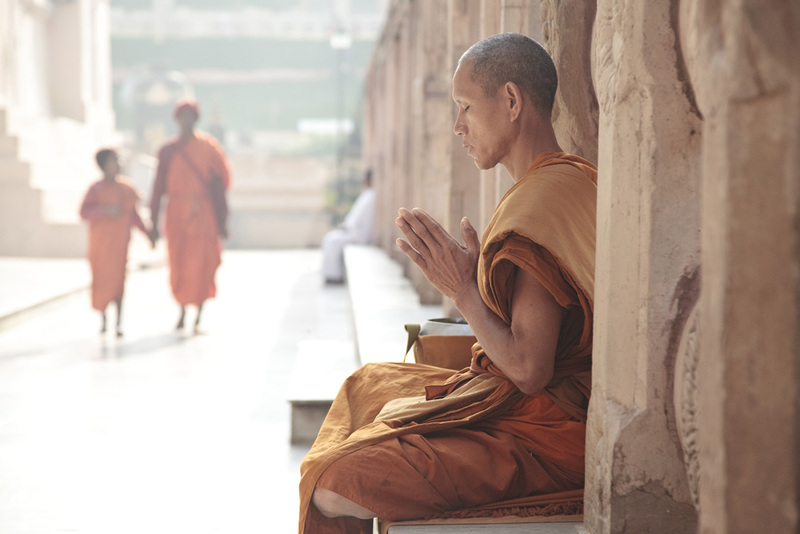 Aside from this temple there are also other monasteries in the town that have been built by the Buddhist followers from other countries. Monasteries built by Chinese, Japanese, Vietnamese and Nepali followers to name a few have all been built here each in their own distinctive national style giving the skyline a disjointed feel. 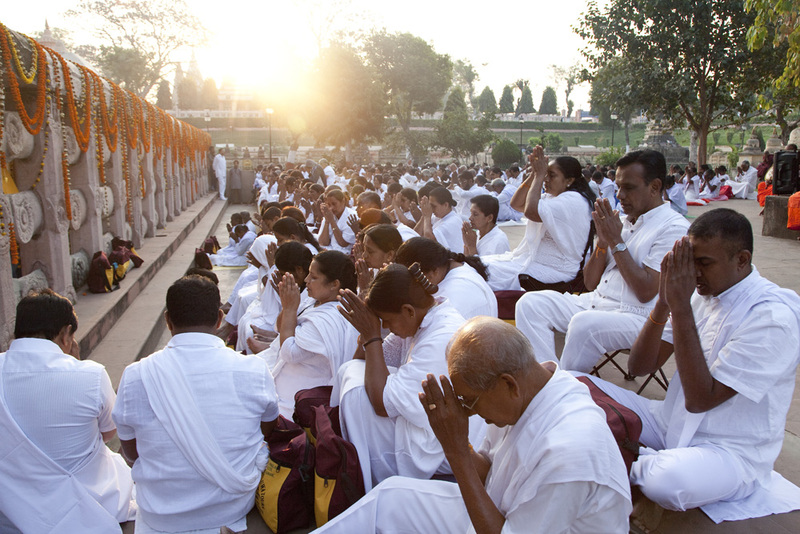 The early mornings in the temple grounds are very peaceful and it’s a time of day when groups of scholars and devotees arrive for sermons. This makes for great photographs as each are dressed in their own distinctive dress which is usually richly coloured. 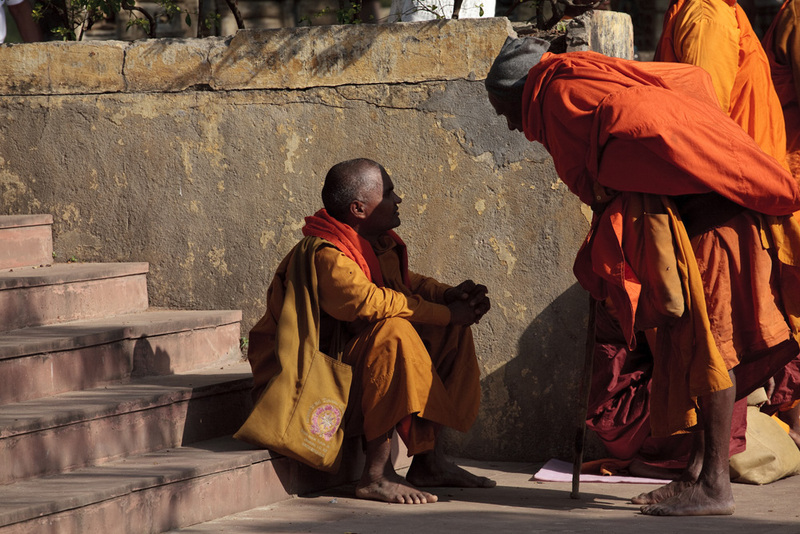 The only time this serene atmosphere is disrupted is when the prized souvenir of a Bodhi leaf falls to the ground and people scramble to get it. People above can be seen waiting patiently but trust me when one of those leaves fall it’s a race to get it. 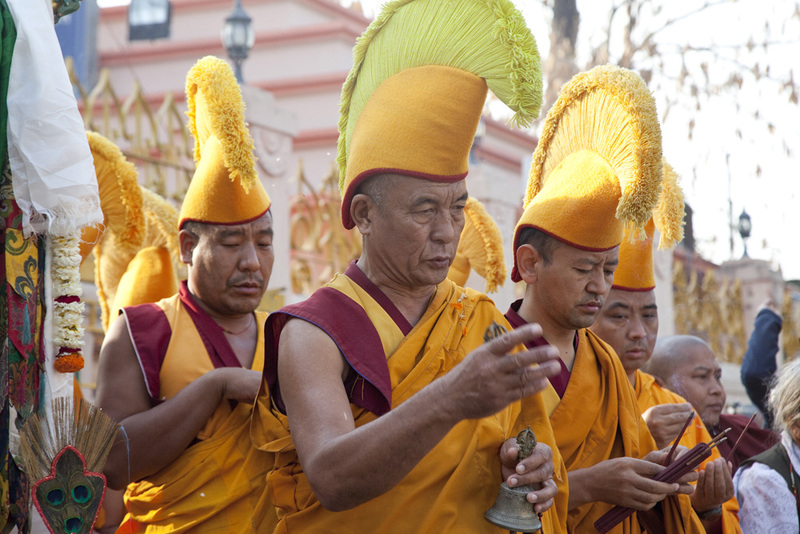 The most striking of the Buddhist national dress has to be the Tibetans who made an appearance this morning. 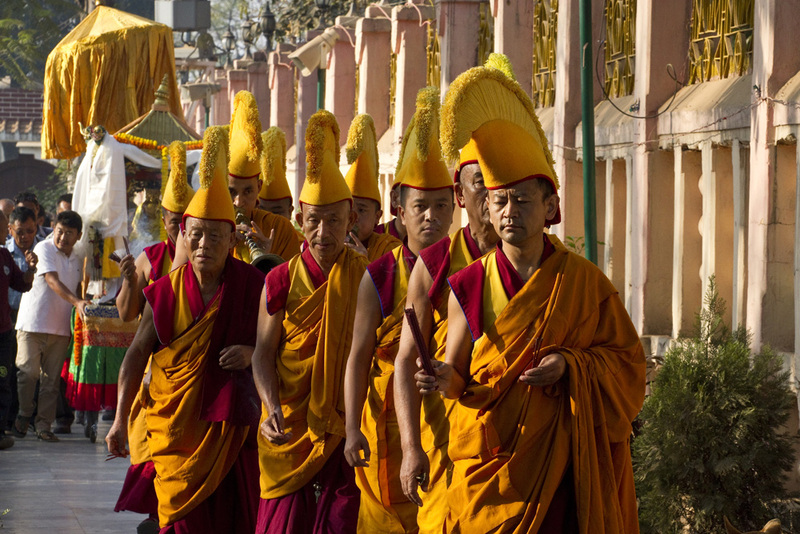 They made a circuit of the temple with their own shrine in procession accompanied by the sound of horns and fantastic sounding deep pitched chanting. 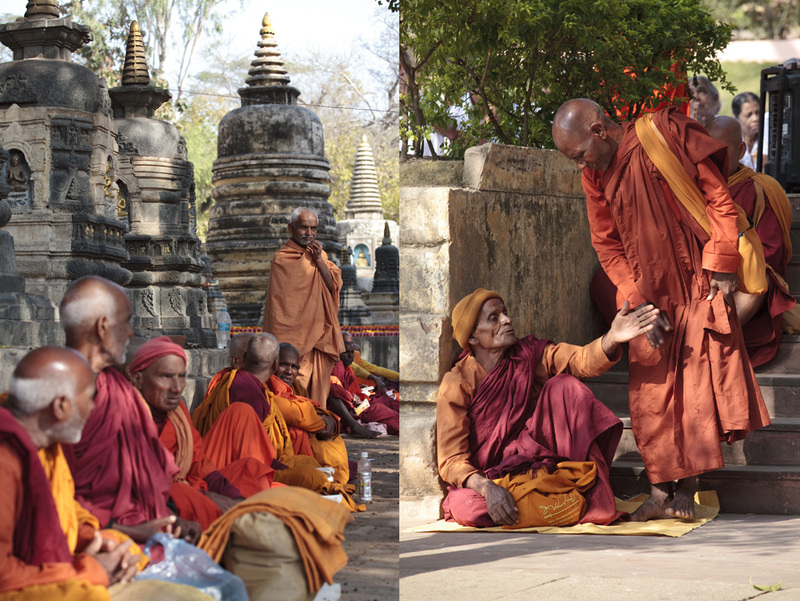 Throughout the temple grounds you can see Buddhists in the act of prayer which I believe is referred to as prostration. 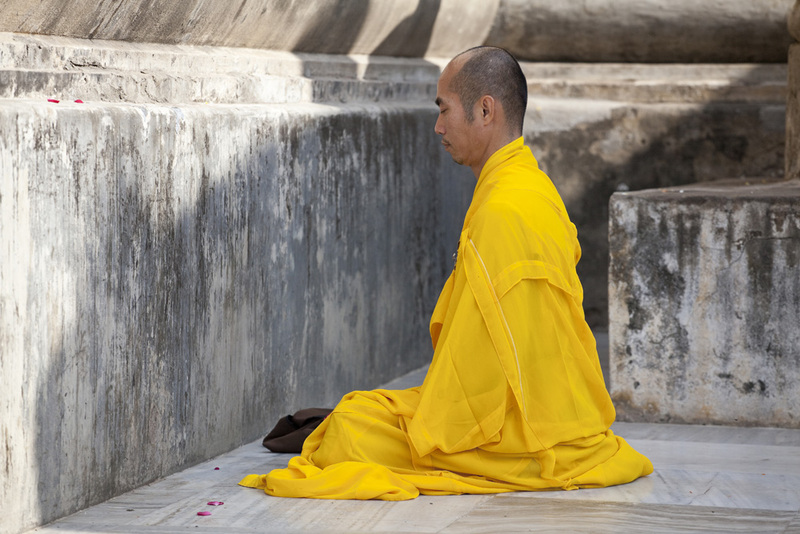 With the use of a board and mats on the hands they stretch themselves out flat and then rise up into a standing position with hands together, then repeat this process over. It’s quite hard to get a sense of the motion in a still shot but you can see some people in the act below. The temple grounds are as I’ve mentioned a very peaceful place. 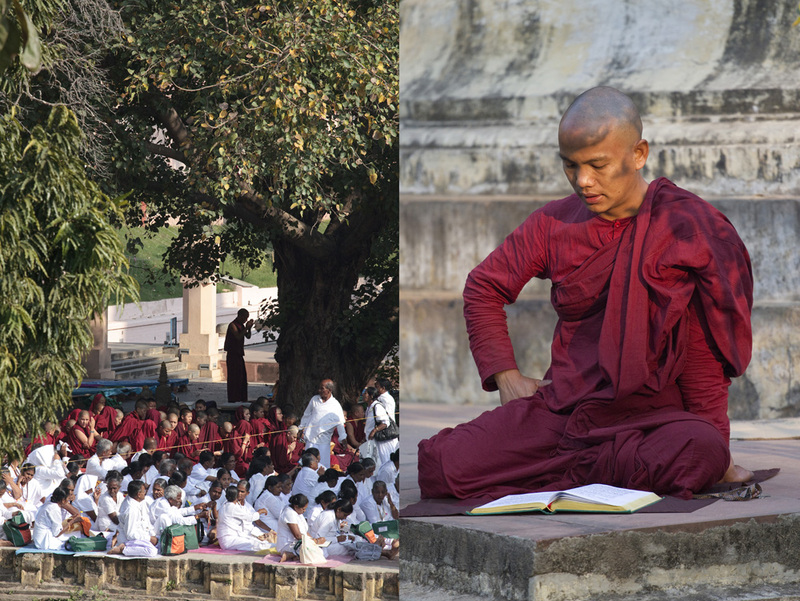 Outside the town of Bodhgaya is very different. It’s certainly not the tranquil Buddhist haven I’d perhaps imagined with lots of traffic and endless souvenir stalls selling tat. 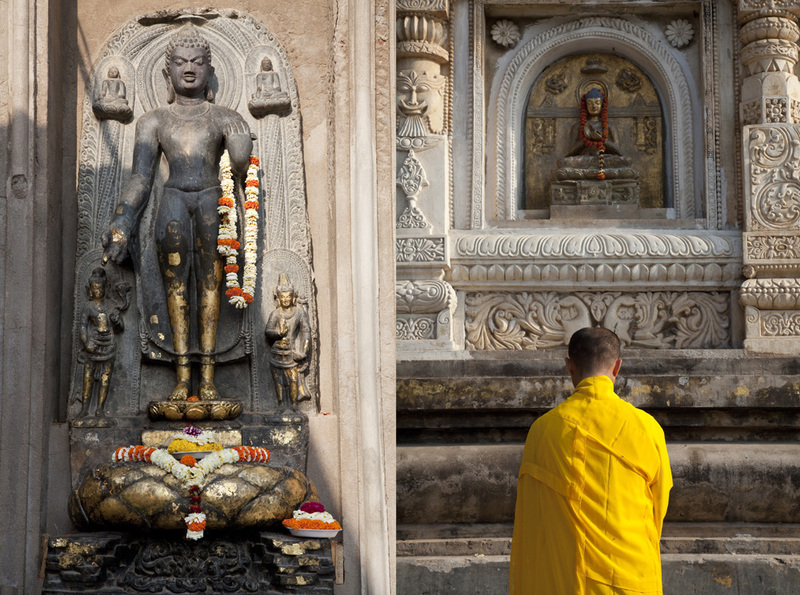 The other sites dotted around the town such as the monasteries and great Buddha statue are not as impressive and quite frankly a pain to get to (especially with the mounting heat here) so for these reasons I’ve concentrated mainly on the Mahabodhi. I’m not sure I’m quite there yet with the shots here but I do have one more full day to shoot before I move onto the next destination. Due to Bihar not offering much to photograph I’ll next be taking a 400km hop into West Bengal to photograph the great city of Calcutta (now known as Kolkata). I’ve heard great things about the place and it will be my first time visiting there. I’m looking forward to being back in the bustle of the city and hopefully it will yield some more interesting images for the project. 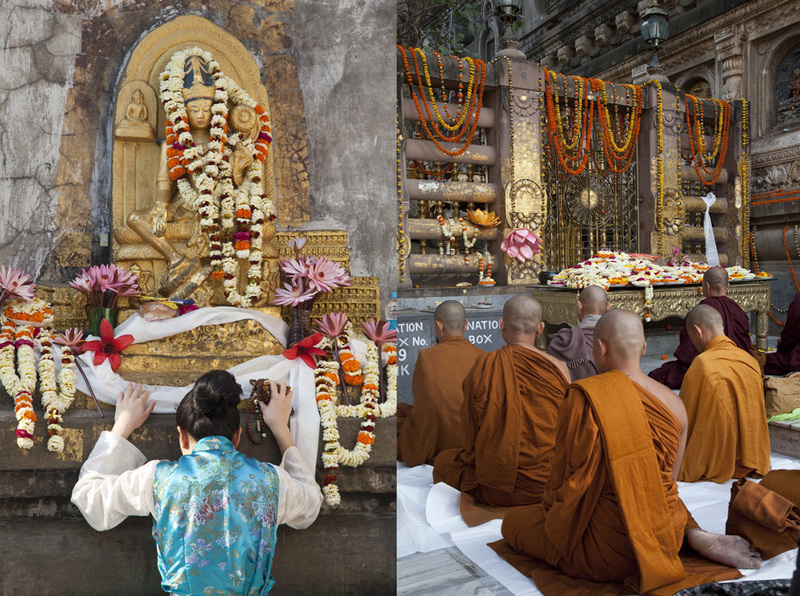 For now here’s a few more images of the Mahabodhi from where I think I just heard the sound of another Bodhi leaf fall….